Greta is a 2013 graduate of CVTC’s Physical Therapist Assistant program. 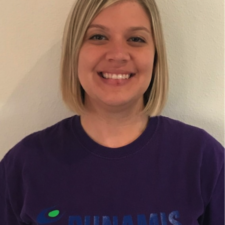 She has been with Dunamis since graduating from CVTC in 2013. She became interested in Physical Therapy following 16 years of gymnastics. Greta enjoys working in an outpatient setting, especially with athletes returning to sport. In her spare time she enjoys spending time with her husband Logan, and her son, Dillon. She also enjoys watching sports on TV, especially gymnastics and football.